3 Is Acidic Water Bad For You? 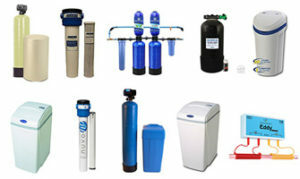 Acidic Water, also known as Electrolyzed water, is any water with a 7 or less on the scale of potential hydrogen (pH). The term Ph stands for the amount of hydrogen contained in the water. 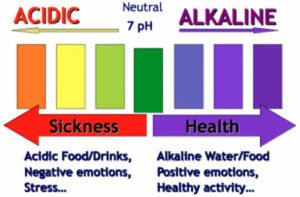 Its level is between 0 and 14, 7 serves as the line of neutrality, where the water is not acidic nor alkaline; from 0 to 7 are the acidic liquids; meanwhile, 7 through 14, which is the rest of the graph shows the alkalinity in things. Medicine – If you obtain acidic water by electrolysis of dilute salt water solutions, you can use it as a treatment of dermatosis. This is if it is still in the beginning stages. You just have to spray or apply it a few times. It is also used as a sterilizing hand wash and to kill micro-organisms in the dental and medical industry. Food – So the medical field has found and uses the benefits of acidic water, but you can do it as well. To remove any bacteria, you can just wash your meat, vegetables, and fruits with it. Healing – If you wish to speed the healing of scrapes, insect bites, cuts, nail fungus, rashes, acne, blisters, eczema, irritation from poison ivy/oak and athlete’s foot you can use acidic water with dilute salt solutions. Plants – Just like it helps healing people’s problems, it can also deal with fungus in plants. At the same time, it will further the growth in plants. If you have any plants that are cut, try moving them in acidic water, they will last longer. Hair Care – If you know the extensive use of apple cider vinegar for rinsing, you might be surprised that you a bigger miracle is acidic water. Your scalp will benefit from it, plus it makes your hair look shinier than ever, naturally and it also becomes soft. Skin Care – In the case of removing oil and dirt without using any chemicals, you can do all of that and improve the complexion of your skin by using water of 7 pHs or less. It acts as a raw astringent and will help relieve itchy and dry skin. Antiseptic – You can, in fact, use water with acidic abilities as an antiseptic for cuts, abrasions and even as a mouthwash that helps with removing any existing plaque from teeth. If you’re also curious about the difference between hard and soft water, don’t forget to read this article! Firstly, let’s take a look at what soda water or carbonated water is. To be classified as such it has to contain dissolved carbon dioxide gas, for it to be there it can occur thanks to either natural geologic processes or artificially by injections under pressure. The process of carbonation makes small bubbles to form, this gives the liquid an effervescent quality. One of its more popular shapes is club soda, sparkling natural mineral water or one that is commercially produced, in the U.S. it also has the name ‘seltzer water.’ A lot of the time manufacturers do also add sodium and other minerals. Now to answer the question. Water and carbon dioxide respond chemically, which produces carbon acid. It is as acid as the taste of mustard in your mouth, because it stimulates the same nerve receptors, so on the scale, it is weak. That’s why you get a prickly, burning feeling, which is mixed since it can be enjoyable and irritating at the same time. The Ph level of carbonated water is 3 to 4 that makes it slightly acidic. Nevertheless, if you drink this beverage, your body won’t be more acidic. No matter what you consume, your kidneys and lungs get rid of additional carbon dioxide. This keeps check on your blood and always balances it at a Ph of 7.35-7.45, making it just a little alkaline. Distilled water is one of the forms of purified water, it is safe to drink, and it is used in chemical experiments, medical and dentist field, everyday drinking as well as for appliances. On the Ph scale, it has a range of 5.6, when in contact with air, to 7 before that contact. This puts between the neutral and slightly acidic. The reason why it’s ph changes when in contact with air is because the carbon dioxide in the atmosphere mixes with the water. Then you have two unstable ions that are trying to make bonds because the reaction of a carbonic acid broke down. This causes the acidic characteristics in distilled water. Apart from that, it also has the value of 7 pH because hypothetically it should be neutral. 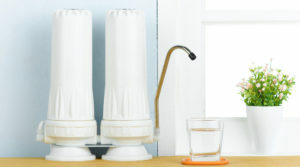 Check out our roundups of the best water distiller reviews here! Actually, sparkling water is a type of carbonated water. That does make it slightly acidic. The “sparkle” in it, which is also the reason for its name, can be produced artificially, by a sparkling water system, or it can occur naturally. Seltzer water – Just like general sparkling water, this type is made from just carbon dioxide which is added to still water. 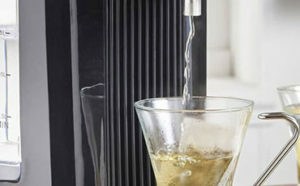 A lot of the times the dispensers and systems for filtered sparkling water, placed in spaces such as hotels, resorts, restaurants, and offices rely on this technology to make sure the water that guests and staff drink are fresh and clean. Sparkling mineral water – This is the natural way of creating this type of water, since it comes directly from mineral springs, so the bubbles in it are a product of gases in nature. Sometimes to boost the foam, companies add carbon dioxide. In the taste, it usually is a bit mineral-y. We keep talking about Ph levels, well we already said that for water to be categorized as alkaline, it needs to have a Ph of 8 or 9. These are the typical values. However, they aren’t the only thing necessary for the structure of alkaline water, what is missing is oxidation-reduction potential (ORP) and soluble minerals. 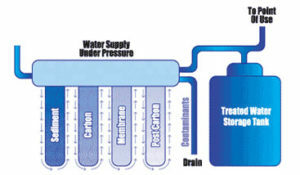 Thanks to ORP water can act as an anti or a prooxidant. To be more and more antioxidizing you need more and more negative ORP value. This leads to why some fruits such as grapefruits, oranges, and lemon are good for us. They are the type of good acidity; nevertheless, there is also bad acidity, which is represented in processed sugar, high fructose corn syrup, and soda pop, to name a few. If you consume the good acidic, this will cause your body to alkalize, thanks to an enzyme, this leads to a balance in your body by helping to detoxify your cells. Bottled alkaline waters just like bad acidic isn’t good for your body, it can lead to an imbalance, due to a buildup of inorganic minerals. 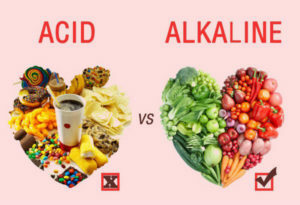 However, there is Alkalized water, which doesn’t cause anything similar to this, in fact, it helps you carry out acidic wastes or toxins, contained in your cells, thus alkalizing your body. That is because alkalized water is clean, meaning it doesn’t have anything added to it as alkaline water has. In fact, it is organically changed with electricity. Is Acidic Water Bad For You? If you use it correctly you can benefit from its ability; however, there are disadvantages of acidic water as well. Due to its corrosive nature, the levels of toxic metals in the water can increase. 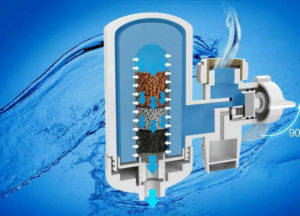 This is because the quality it has causes metal ions such as lead, zinc, copper, iron, and manganese to drain in your beverage. That’s why if you have any suspicions of acidic water, you can check your copper or iron pipes for blue or rusting stains, they are evidence for corrosion caused by the acidity. It can also cause pipe failure and pinhole leaks after some time. If you taste it, you can feel a metallic or sour flavor. Earlier we talked of the different ways you can use acidic water, now let’s take a look at how in those uses, sometimes it can be wrong, even harmful. Consumption – Because acidic water contains heavy metals, if you drink too much of it, you can get very sick or risk becoming poisoned from them. Cleaning – When it comes to using acidic water, the more often or, the longer you do it, the more likely you are to see negative results. If you bathe with this water, after some time, you may notice rashes starting to develop on your skin that is if the pollutants are severe. Skin & Haircare – Using this fluid it can actually be more helpful than harmful for you in this situation. It is safe to use acidic water and even get some benefits from it if you don’t submerge your face for a long time and too often. Just make sure you somewhat quickly rinse it off with non-acidic water if you do this treatment. However, if you use it on your hair, know that over time it can become more brittle so it might be a good idea, to just keep the usage of only your face. 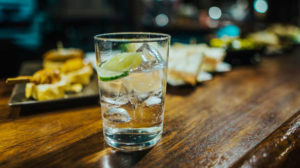 Teeth – It is advised that you use alkaline water instead of acidic in this case because the acidity can encourage bacteria growth as well as lead to cavities. The same can be said about your gums as well, they will be better protected with alkaline water. Cooking – We mentioned that people can use acidic water to clean their vegetables and fruits. It’s important to note here that this is the only time when you won’t boil acidic water, in other situations where you use it in cooking, it is always good to cook it. This won’t allow you being exposed to contaminants that might be in it anyway. It is good to know the Ph of the water in your house because if there’s any problem with it, you can treat it accordingly. Plus just like it is good to be aware and healthy with the food we put in our body, we should do the same with the liquids we drink, not just water. But since it’s our primary source of drinking and its really vital for us to live we will look at how you can test your water sources, so you have a good idea of your water. When you smell it, there’s a sharp or chlorine odor. However, for a better and more precise data, you can use a test kit. They can be bought at any pool, health food or aquarium supply shop. Usually, there is a chart where each number has a specific color next to it, which makes it easier to identify. You also have included test strips, which will change color when you wet them. Firstly, prepare a clean glass and fill it with water from the tap so you can use it in the test. Get one of the test strips from the kit, but make sure your hands are dry and try not to wet it before putting it in the glass. So just be aware of that. To be precise and sure, check the instructions on the Ph test kit for the amount of time that the strip needs to be in the glass. Do not stir the piece, just dip it in the water for the time you read in the instructions. Remove it once this time has ended. Hold the test strip level and wait till the end of it, the color indicator stops changing. The color is going to stay the same for some time, that’s how you will now. To read it, all you have to do is compare the chart that was in the Ph test kit, with the color indicator on the strip itself. Each color is an indication of a different level. Since you can’t use the strip again, there’s no need to preserve it, so just dispose of it. Another option if you want to test the ph of your water is by using a Ph meter. This one is even easier. All you have to do is prepare 100ml water in a glass for testing, and then you put the device in it for a minute. The display on the instrument will show you automatically the ph value of the liquid. In the regular interval, we will have to check and correct the ph meter reading, this is because it’s a piece of electronic equipment. To calibrate the device, you can use calibration powder and water with correct Ph value that is displayed on labels. Most of the time the instrument comes with its own calibration powder so at first, you won’t need to buy any separately. This is a good way of testing for acidity because you can use it multiple times, as long as it’s calibrated because if not, you will get incorrect data. You can also use a universal indicator chart and a ph solution. Just like the test strips kit, you can find these solutions both online and in nearby aquarium stores. To identify the ph value here, you have to use the color value you are provided with. Here you only need 10ml of water, you put it in either a small glass container or in a test tube. Then you drop five drops of the ph solution inside. Mix it well with the liquid and just like with the test strips you have to see which color matches with the ones on the color strips in the solution label. Just like the meter, you can use it again in the future. 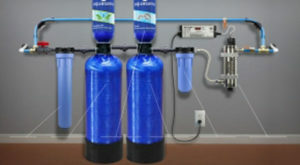 You can also use this to analyze the water in an aquarium or a fish tank. 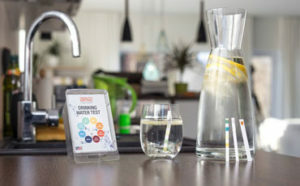 The last option for testing the pH level of water at home is with litmus paper. This is a really old of finding this date, but it’s still an option, plus there are many people even taking advantage of it. It doesn’t provide accurate value, as the others do, but you can still see if the water is acidic, neutral or alkaline. Here you have two strips, you take one from each, so that’s one red and one blue. You can either dip the piece or drop the water on it. If the nature of the water is acidic, the blue paper will run red, while the red one won’t change. The opposite goes if there’s alkaline nature, so the red will turn blue, but the blue won’t differ. In the case of neutral, both of the papers won’t change their color. ere, you’ll find our pick of the top water ionizers you can buy.